ADF BC. Multiple LOVs for VO's attribute. Everybody knows how to define LOV for view object's attribute. But what if depending on application's logic it's needed to get values for LOV from different sources or with completely different conditions. 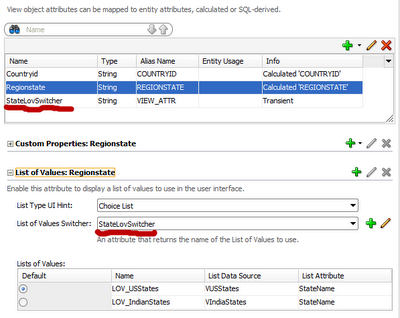 For suer, it's possible to define complex SQL query for LOV's VO and play with it's parameters. But most likely we'll get performance issue using this approach. And what we should do if it's required to use different display values for different use cases? ADF BC allows us to define more than one LOV per attribute. Let's say I have VO representing some form to input address information. 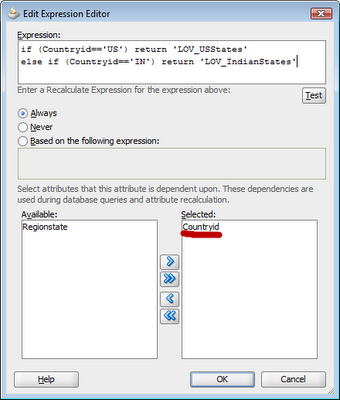 It has attribute for country and attribute for region or state. If country is USA, user should select one of the US states, if country is India, user should select Indian state, in other cases user doesn't need any LOV and should input region manually. I defined two LOVs for Regionstate attribute. Each of them retrieves values from its own data source (US states and Indian states). In order to switch LOVs I defined new transient attribute StateLovSwitcher. The value of this attribute should contain proper LOV's name. I'm going to provide user by two input controls for Regionstate field. For US and India user needs SelectOneChoice in other cases he needs InputText. I'm using af:switcher showing SelectOneChoice if StateLovSwitcher has value and InputText if it doesn't. And finally in order to get it working fine we need to clean region's value if country changes. You can download Jdev11.1.1.2.0 sample application for this post. ADF BC. Adding validation rules to Entity object. If you need to add validation rule to programmatically created Entity object or you just have to add some rules to the entity's attribute "on the fly", you should use implementing classes of JboValidatorInterface. ADF Model's Java API has appropriate implementing class for each validation type. If you need something "special", you can create your own implementation of JboValidationInterface. In this post I'm going to show a couple of examples of using JboValidator classes. //The key in your resource bundle properties file. ADF BC allows us to use Oracle object types in quite easy way. If your table contains attribute of Oracle object type, JDeveloper creates corresponding domain class automatically. Or you can create it manually using Create Domain Wizard. 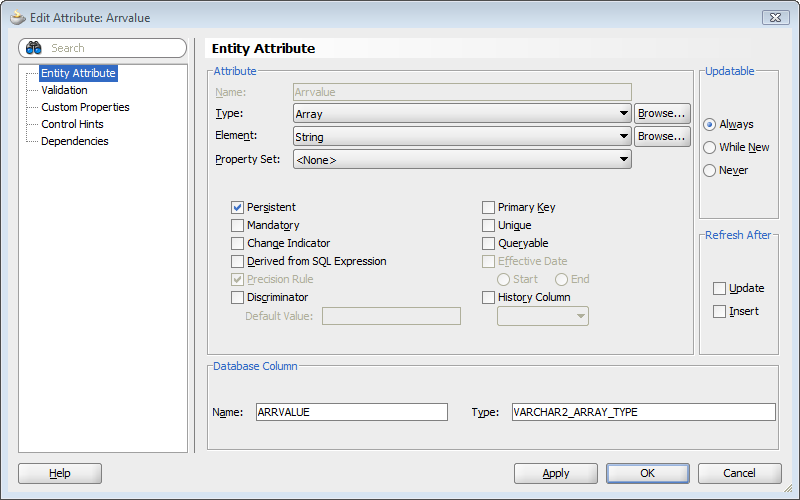 After that you can work with the attribute as if it had regular type. But! If you need to work with collection type (like ".. as table of ..."), it works in a little bit different way. 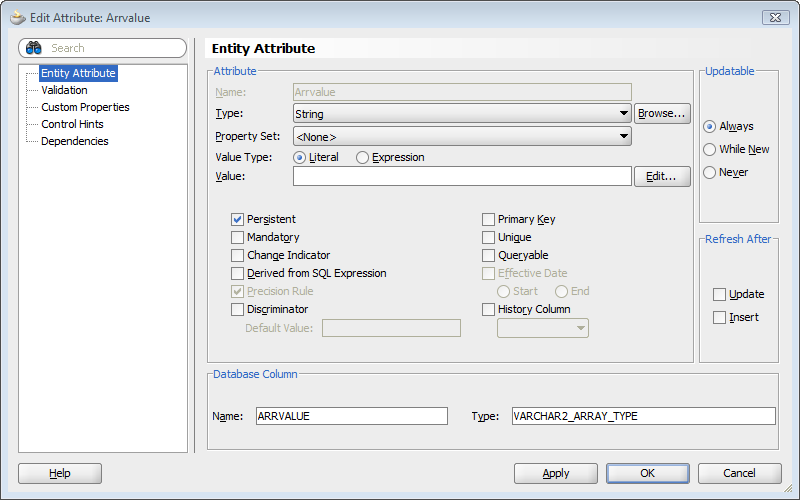 Have a look at the type of ArrValue attribute. It is String!!! I don't know why. JDev 11.1.1.4.0 seems to be a bit smarter as for working with collection types. 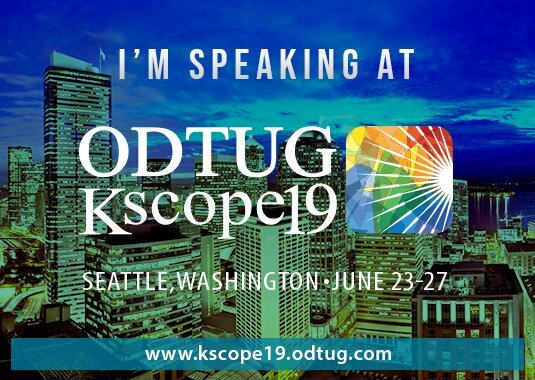 But never mind if you're using JDev 11.1.1.2.0 or earlier. Magic button "Browse" will help. 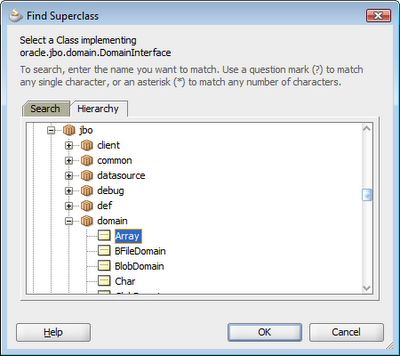 You can manually choose needed type - oracle.jbo.domain.Array. 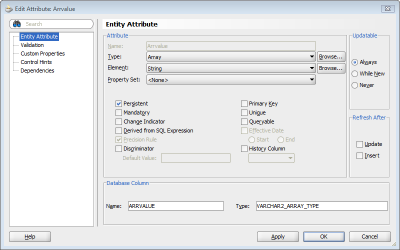 For sure using oracle.jbo.domain.Array is not limited by arrays of varchar2 or number. 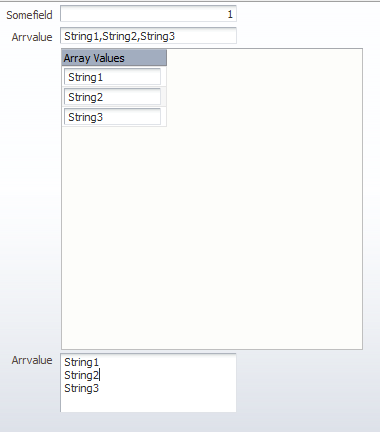 It allows us to work with really complex data type structures.